Material handling in industrial settings requires basic equipment — trash carts, trash cans, bulk containers, specialized Mobile Bins — that is designed for the rigors of industry. A trash can built for residential use will quickly fail when loaded with steel scraps, building debris, or production-scale food ingredients. Mobile Bins from BHS are designed and manufactured for durability, reliability, and long-term use. They are the ideal carts for high-capacity material handling in all industries. Browse the BHS collection of Mobile Bins below. To find your nearest dealer, call the BHS sales team at 1.800.BHS.9500. Sturdy rolling containers for waste or bulk materials. FDA-compliant storage and transportation for food ingredients. Lightweight, high-strength materials.The perfect trash cart is light enough to roll easily but strong enough to withstand tough industrial environments. The MGB realizes these contradictory goals with HDPE plastic that was specially formulated to resist corrosive chemicals and extreme temperatures. This plastic is known for its high strength-to-weight ratio; manufacturers of products from kitchen cutting boards to natural gas pipes prefer the material. It is odor- and stain-resistant and completely recyclable. Ergonomic design for greater user safety.The Occupational Safety and Health Administration warns against awkward postures and overexertion when pushing carts to avoid the development of a musculoskeletal disorder. 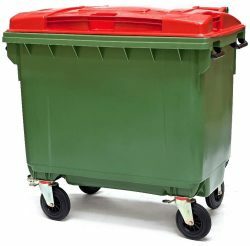 Unfortunately, some rolling trash cans are designed with poorly placed handles or casters that fail in all but the perfect terrain.The MGB avoids these pitfalls. Large-grip handles on all sides of the unit distribute pressure, preventing nerve damage in the hands. Easy-rolling casters with large rubber wheels travel smoothly over most terrain until you engage the powerful lock. Fix the wheels into place with the integrated direction-locks to tow the unit. Detailed design for the modern waste stream.Mobile Garbage Bins are built to respond to the current demands of industry. They ship complete with RFID chip nests, ready for integration with house identification and weighing systems. Secure lids channel water away for outdoor use year-round. All surfaces, internal and external, are smooth and rounded for easy cleaning, and a drainage plug in the base allows users to simply spray out the unit with a hose. Mobile Garbage Bins and the rest of the items in the BHS collection of Mobile Bins can be used in virtually any material-handling application. But they are particularly well-suited for service in the waste-handling industry, from source to recycling center and back again. Easily accessible for cleaning and inspection. These requirements make stainless steel the go-to choice for the food service and production industries. Stainless Steel Food Service Bins meet all of the FDA’s requirements while improving ergonomics and efficiency in food-processing applications. Interior angles curve gently, creating an entirely smooth inner surface for easy cleaning. 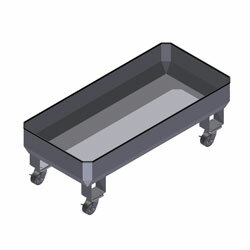 These ingredient bins also feature heavy-duty casters in an offset diamond arrangement to improve maneuverability during travel and stability at rest. To learn more about Stainless Steel Food Service Bins, or any of the other products in the BHS line of Mobile Bins, call us at 1.800.BHS.9500.